If you need a place to put your ornaments when the holiday season is over you can purchase a commercial ornament storage box or repurpose any plastic storage tub to do the job by gluing clear plastic cups to a piece of cardboard sized to fit in your tub. 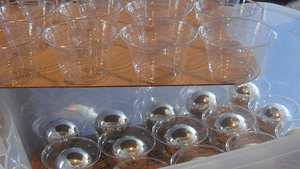 Crafting weblog Design a la Mod originally found the idea from Martha Stewart but tweaked it to use smaller clear 9-ounce cups instead of standard 16-ounce disposable cups. The original author used a hot glue gun to bond the cups to cardboard cutouts and was able to fit four layers of these containers in a plastic tub with each layer having twenty cups to hold ornaments. If you already have a spare plastic bin this should save you some cash as many commercial holders sell for $20-45 on Amazon. Also, egg cartons are great at holding holiday ornaments.